Four Navy nurses from National Naval Medical Center, ensign through lieutenant commander, conducted a tradition for one of their own, but one they never knew. Ensign Sarah Lafave, Lieutenant (j.g.) Lori Thomas and Lieutenant Amy Noyes, all rom the Neonatal Intensive Care Unit, and Lieutenant Commander Vicki Edgar, operating room, comprised the Flag Detail for Lieutenant Commander Dorothy Still Danner, NC, at the Women's Memorial August 31, 2001. Danner's remains were interred in Arlington National Cemetery earlier that day. Danner was a Japanese POW during World War II from January 1, 1942, through February 23, 1945, when she and the other nurses, known as the "Sacred Eleven," were rescued by American troops. The others were Chief Nurse Laura Cobb and Lieutenants (junior grade) Mary Chapman, Bertha Evans (believed to be the last survivor of the group), Helen Gorzelanski, Mary Harrington, Margaret Nash, Goldie O'Haver, Eldene Paige, Susie Pitcher, C. Edwina Todd. In May of 1943 they were sent to the prison camp at Los Banos in the Philippines. They established an infirmary although they had virtually no medicine or supplies and continued to nurse the sick until Los Banos was liberated in February of 1945. Noyes, who did not know of Danner prior to becoming part of the detail, said she seemed like an inspirational woman. "Prior to this ceremony, only Lafave and Thomas knew of Danner. As we were passing the flag through, they read her story from the time she entered the Navy. When they were reading what she went through as a POW . . . making her own uniforms to keep the military manner . . . surviving on 500 calories a day . . . running a full hospital with thousands of patients . . . being sentenced to die. . . going through all that she went through and still surviving for acting like a Navy nurse." At the end of the ceremony, Edgar presented the flag to Martin Danner, youngest son of Dorothy's three children. "I had a chance to speak with Martin and he said his mother being buried here gave the family a big sense of closure since the Navy was such a big part of her life," said Noyes. "At Los Banos our first order of business was to get our 25-bed hospital functioning. We initially had two American civilian doctors, but they were repatriated in August 1943. In their place we got another American doctor, Dr. Dana Nance. "He was a young fellow, one of those charismatic characters who got out there with the baseball teams and was very concerned about his patients. He was a surgeon and brought his own instruments. Patients who had been sent back to Manila for surgery were now handled in our hospital. We also had a dentist. "The rescue plan was complicated because it was out of the ordinary. Thus far, the Americans had only liberated prisoners in their line of advance. But a Los Banos rescue meant going far behind enemy lines to rescue a little over 3,000 people. Paratroopers themselves were to be dropped over Los Banos and attack in conjunction with infantry who would come ashore in amtracs (amphibious vehicles) from a nearby lake. These amtracs would then evacuate many of the civilians. "We didn't know the rescue was going to happen, so we were all feeling pretty low. I was on duty that night . . . all of a sudden we saw a formation of aircraft coming over . . . paratroopers started jumping out . . . then the amtracs came in, crashing through the swali-covered fence near the front gate. An amtrac pulled up in front of the hospital and the American troops jumped out. Oh, we never saw anything so handsome in our lives." Danner went on to write a book about her experiences called "What a Way to Spend a War." Dorothy Still Danner: A loving mother and grandmother, she passed away Saturday, June 16, 2001, at the Idaho State Veterans Home in Boise, Idaho. A longtime resident of Carlsbad, she was born on November 29, 1914, in Saginaw, Michigan, and grew up in the Los Angeles area. She was a rtired registered nurse. 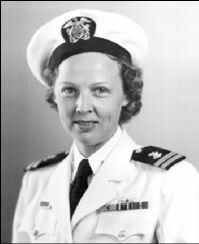 She served in U.S. Navy during World War II as a nurse. She will be interred with full military honors at Arlington National Cemetery on August 31, 2001. Ms. Danner is survived by her children, Margery Danner-Roth of Baton Rouge, Louisiana, Dan Danner of Aptos and Martin and his wife Peggy of Boise; grandchildren Vic, Bobby and Lori Roth, all of Baton Rouge and Jason, Gregory and Charlie Danner, all of Boise. She was preceded in death by her husband, Goldburn "Peck" Danner. Members of the Flag Detail for Lt. Cmdr. Dorothy Still Danner: (from left) Lt. Amy Noyes, Lt. Cmdr. Vicki Edgar, and Lt. (j.g.) Lori Thomas. Ensign Sarah Lafave holds the flag that was presented to son Martin Danner.